Is it normal that the slot gasket needs replacing about every 6 months or less? 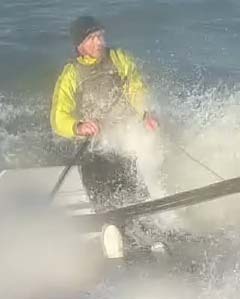 It seems to pretty quickly develop a bend inwards which no longer seals the slot and any speed downwind produces a impressive jet of water from the slot that fills up the back of the boat! It seems like a design flaw? Or is it a user flaw.... in which case can someone enlighten me as to what i'm doing wrong?? Having just upgraded you to 'James', I'll now send you back to being 'Mark'. Apologies. - the same thing happens with mine, but I've found that once the water starts gushing, if I uncurl it by hand and bend it back into shape I can get it back to normal for a bit - I still haven't replaced it. It is worth ensuring the plate is absolutely fully up after sailing, then tieing it up to keep it there. And if travelling/towing, definitely tie it up. And remember to untie before launching! Don't be tempted to cleat the uphaul thru the mainsheet jammer  - i did that and bent the turret over! Clive, i think you're right that being stowed not fully up is the problem, hadn't thought about tieing it up however, good idea, thanks, will do for Garda trip. I agree with Clive's suggestions about tieing the centreboard up, although i have to say I never have and have not had to replace the slot gasket after nearly four years. Having said that, I think I need to replace it in the near future. 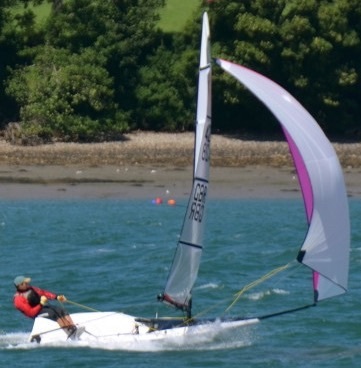 I sailed the Nationals with a couple of bits of gaffer tape holding it together. I wasn't too slow at the Nationals, but they are now loose and flopping about. Maybe I should do the Australia 2 thing and convince everyone it's a speed enhancing hull appendage? On a serious note, it would be very helpful if everone could put there comments about the best way of replacing the slot gasket and which glue to use. I know The Youth had some experience at Weymouth and Mark kindly gave a few pearls of wisdom after Alistair had replaced his slot gasket along the lines of 'you shouldn' have done it like that'. Once I know what to do I'll change mine over and go much faster. My gasket started to peel off after a year or so of buying the boat from new. I pulled it off completely, cleaned it and the hull up with acetone and stuck it back on with Sikaflex 291i. I did it with the boat upright and jacked it up using a strip of wood along the length of the gasket to really press it home. It's been stuck firmly ever since although it's gradually become discoloured and there are a  couple of transverse breaks in the free material - not the stuck on part. (I guess it's more brittle than originally.) These transverse breaks match up exactly so don't add drag or let the water up and I think they make moving the board up and down easier as the gasket is effectively in sections. LDC do a complete package..The gasket and the glue..Including a how to do it guide..
Thixofix (£3.68...enough to do the job with plenty to spare) is perfectly adequate if you prep the job properly. Read Pete Vincent's advice on the following link. 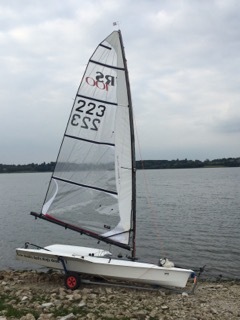 (http://uk.rs200sailing.org/index.asp?selection=The%20Boat&subsect=Technical&Fleet=RS200). P.S. Get the gasket and glue from Roosters...post free. I have a new slot gasket to replace my 5 year old one. I think I've done pretty well lasting for 5 years before replacing it, but I now have to take the plunge. with the boat on its side and the board down offer up the new gasket  so it is in the right place around the board and temp. tape in in place with a bit of insulation tape and put some pencil marks on the boat and gasket some this position can be replicated with the boat down. Check that the overlap between the 2 halves is only 3 -5mm  and trim (off the boat with a sharp pair of sissors) as required. If it is wider the gasket creases when the board is pulled up and down. I also make the hole at the back bigger, the same shape but the full width of the slot. Mix up only half the glue as the is enough to do 2 gaskets and follow instructions. Thanks Mark. Very helpful. I will follow your suggestions so I can blame you as and when it goes horribly wrong. Who do you blame for the Blue Stripe? I changed my gasket a couple of weeks ago..What a long process getting all the old glue off!! Which brings me to my question. The 'stuff' I was removing from the hull was white and felt like a silicon based product. The Hypabond I used on the replacement is more like a conventional contact adhesive. Has anybody come across this white glue? I wondered if this was the factory fit glue which gave slightly more flex to the gasket when in place..
PS- I had to trim the length and the foil shape around the plate in the 2 halves to get the 3mm overlap..
PPS - The most valuable tool I used was a very sharp 1" chisel to remove the majority of the old glue!! (I think I would still be there now if I relied on the fluid).. This sounds to me like some kind of sikaflex, or similar, can't remember the number. The gasket on Blaze's was always a bugger of a job and I also used a sharp chisel to get old glue off. I recall one guy had used wet-grab adhesive to do his but I always got a decent result with Hawk strip and Thixofix. Mine needs doing so I will most likely be back on here with tales of woe! My gasket started coming loose at the back, by the drain hole . glued it back on . why the drain hole ? previous Rs 400 did not need one and gasket was not cut round centreboard and it did not seal as well as 100. So taped it up with insignia tape, boat does not fill up with water and is quieter and gasket has not dropped off. Hi, I need to replace the slot gasket for a RS100 that I bought used.It will be my first repair on it. When I look at it, I'm surprised there seems to be wood: see the picture. Does anyone know why this would be?